How many worried does a woman have before giving birth? Gucci decided to liberate modern women from at least one of them: the baby carrier. 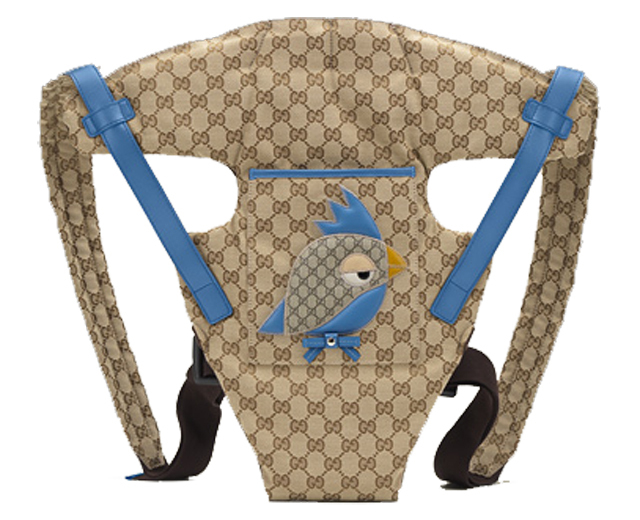 Created especially for mommies who want to hold their babies tight in their arms and close to their heart while walking down the street, but to remain stylish at the same time, Gucci Baby Carrier is the ultimate accessory to buy if you are preparing for motherhood. At the same time, this baby carrier is also a great idea for a present in case you are attending a baby shower or one of your best friends is about to become a mother. Especially if you are experiencing the joys of motherhood for the first time, it is difficult to figure out in advance what your kid needs in advance. One thing is, however, sure: all infants need to feel your love and protection. This was the whole idea behind Gucci Baby Carrier: to enable women to carry their baby in full safety, while keeping their hands free and remaining elegant. Equipped with great looking adjustable leather straps, this baby carrier is reliable and easy to use, being able to hold infants aged between 3 and 9 months and weighing less than 9 kilos. While the most commonly seen model is the beige one with brown straps, Gucci has created some other variations as well, including a cute zoo themed one whose straps come in a sweet blue color. Some may consider this baby carrier model as too conservative, but it is certainly classy. Remember this was Gwen Stefaniâ€™s choice and she is known for her class and sophistication that motherhood did not succeed to take away from her. For sure, the actressâ€™ fans appreciate that about her.